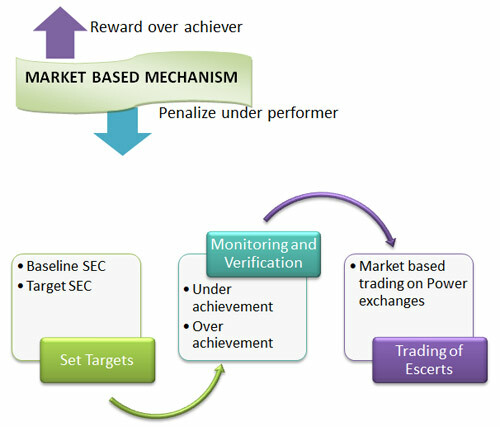 One of the most important initiative under National Mission on Enhanced Energy Efficiency (NMEEE) is Perform, Achieve & Trade (PAT) mechanism, launched by Bureau of Energy Efficiency (BEE) under Ministry of Power on 4th July, 2012 at New Delhi. PAT is a market-based mechanism to step up and incentivize energy efficiency in large energy-intensive industries. The scheme covers 478 Designated Consumers(DCs) from eight energy-intensive sectors—thermal power, aluminium, cement, fertilizer, iron and steel, pulp and paper, textiles and chlor-alkali. These eight sectors account for 25% of GDP and about 45% of India’s primary energy consumption and consume 165 million tonne equivalent of energy consumption annually. It facilitates the DCs to achieve their legal obligations under Energy Conservation Act, 2001, but also provides them with necessary market-based incentives to over-achieve the targets set for them. Based on cross-verification report, BEE to recommend to the Central Government for issuance of Energy Saving Certificates (ESCerts) for DC. DCs who achieve reduction in baseline specific energy consumption (SEC) in excess of targets will be entitled to sell ESCerts. DCs who under-achieve their targets can comply by purchasing ESCerts from electricity exchange or by paying a penalty. ESCerts to be traded only on electricity exchanges such as IEX. Penalty for non-compliance in accordance with EC Act, 2001. Also, the amount of unmet target to be paid at prevailing oil price.